Visual Basic (VB) is one of the fastest growing programming languages in the industry. Although less powerful than C++, it already provides powerful constructs that allow the development of large applications of similar complexity to Java and C#. Hence, large industrial VB code bases have the same challenges as exhibited in other programming languages. One such challenge is the presence of code clones, i.e. code fragments of identical semantics and (nearly) similar syntax. Finding and removing such fragments automatically in large code bases is a difficult process. In this project, we developed a framework for syntactic detection and automatic removal of code clones in VB. The tool consists of the following components. The first step required for automatic refactoring is syntax and semantic analysis. We have built a full syntactic and relatively complete semantic analyzer for VB as a separate component in our framework. The analyzer covers the full grammar of VB and builds a complete abstract syntax tree (AST) directly from VB project files, which handles both source code and libraries (assemblies). It also saves location information and allows AST editing and pretty printing of the code for refactoring purposes. Semantic information is saved in a separate type system. Both syntax (AST) information and semantic information are queryable by means of APIs after a project is analyzed. For full details, see the documentation below. 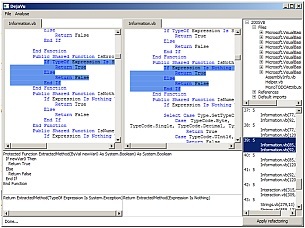 The syntax and semantic analyzer efficiently handles large code projects. On a typical PC, analyzing a project of 100000 LOC takes under 1 minute. Clones are detected using syntax and semantic information as contiguous code fragments which have the same semantics and (nearly) the same syntax. Variable name changes and expressions which have different syntax and possibly type but the same semantics are also found as clones. After clones are detected, their instances are refactored by method extraction: the code of the clones is replaced by calls to a newly generated method which contains the common code. The refactoring automatically inserts the correct code to call the new method, including parameter passing and return values. All above operations are doable in a GUI front-end with just a few clicks. A snapshot of the tool is shown below. The documentation on building, installation, and use of DejaVu will come soon here. The static analyzer, code clone detector, and program transformation framework is described in detail in the MSc thesis of Liewe Kwakman available here.